(CBS) Do violent video games breed violent kids? A new study suggests that young adults who play the games become desensitized to the guts and gore - and more prone to aggressive behavior. For years, critics have claimed that video games can contribute to violence, but no study had ever shown a direct link between the games and aggression. "Video games are excellent teaching tools because they reward players for engaging in certain types of behavior," study author Dr. Bruce Bartholow, associate professor of psychology at the University of Missouri, said in a written statement. "Unfortunately, in many popular video games, the behavior is violence." For the study - published in the Journal of Experimental Social Psychology - researchers at the university had 70 young adults play either a violent or nonviolent video game for 25 minutes. After the game, the subjects looked at neutral pictures - like a man on a bike - or violent pictures - like a man with a gun - as the researchers measured their brain wave activity. It turned out that when shown a violent image, those who had played a violent game showed a smaller brain response than those who had played a tamer game. In other words, the violent games desensitized players to violent imagery - and subsequent testing showed that gamers who played violent games like "Killzone" and "Grand Theft Auto" behaved more aggressively against their gaming opponents. 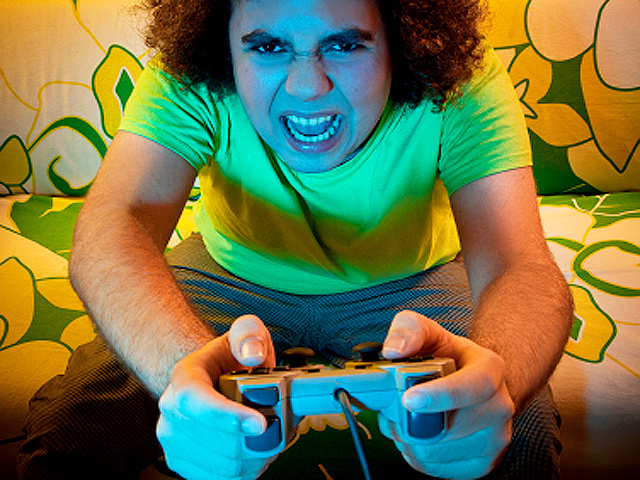 But does gaming behavior turn kids violent? "A single exposure to a violent video game won't turn someone into a mass murderer," Dr. Bartholow told CBS News. "But if someone has repeatedly exposed themselves, these kinds of effects in the short term can turn into long-term changes." The American Psychological Association points to several studies linking video game violence to fighting at school and even to violent criminal behavior, such as assault or robbery. But not everyone is convinced that the links really exist. Dr. Henry Jenkins, director of the comparative media studies program at the Massachusetts Institute of Technology, told PBS that playing video games is just that - play - and that children are well aware that the rules of the game differ from those that apply in real life. "A child who responds to a video game the same way he or she responds to a real-world tragedy could be showing symptoms of being severely emotionally disturbed," he said. Still, the new study may have parents wondering: Is it time to pry the controller from junior's hands?